SLPG-500 is water-soluble macromolecule anti-bacterial material, kills and inhibits intensively a wide-spectrum bacterial, fungus and algae. It causes no adaptive microbial, easy for production, resistant to heat and ultraviolet radiation. It causes no mutation of microbial (AMES test), and compatible with all kinds of polyester, plastic etc. SLPG-500 is low toxicity and causes no stimulation, irritability or super sensitivity to skin. Contains no heavy metal or halogen, no smell. Stability: stable to acid, alkaline between pH 1-10, stable to ultraviolet radiation, decomposes at temperature higher than 250 Celsius degree. Applies well to non-ionic or positive-ionic system emulsion, plastic, textile and paper etc., provides very high effect of anti bacterial, fungus and algae. 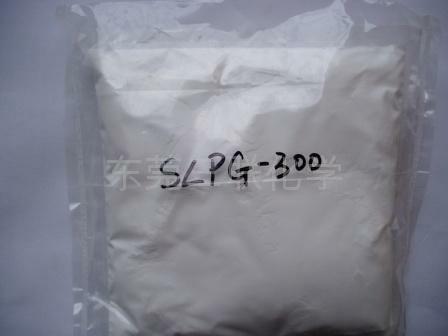 SLPG-300 is suggested to be added at any process of production at a dosage of 0.2-0.5%, just stir equably. Wanjiang district, Dongguan city, Guangdong province, P.R.C.